Ok, it is high time to stop clowning around. All the games of the second round ended in a draw, but we, the fans, have no complaints, it was exciting and captivating. It did not captivate me absolutely, to tell the truth, and after the first control I decided to save my strength (in particular to be able to write this text afterwards) and went to bed. I felt for Sergey Shipov, who had to annotate the duel online, as the game length exceeding reasonable average. I did not have remorse that I went away, and he stayed without even knowing about my departure, and I did not think, if everyone did the same, than whom he endeavored for. The Earth is round, and Sergey's audience consists not only of his compatriots trying not to fall asleep, but also of the Europeans drinking their evening tea and the Americans still sitting in their offices. (The thought that the Earth is round could be presented more ceremonially, but Morozevich recently used it actively in the interview about Argentina). Having woken up, I downloaded the pgn-versions of the yesterday matches from the TWIC site and saw that Leko and Morozevich agreed to a draw on the 43th move. Then I studied Shipov's online annotations, talked to the «64» executive secretary and suspected that there were more than 43 moves in the game. I went on the ICC and found out I was right, there were plenty more of them. And it would be strange if Alexander let Peter go in peace. Generally speaking, the retardation of this duel was disagreeable to some astral beings. Somewhere on the 30th move there was news on ICC that a game ended in a draw, though at this very time Leko had an extra pawn and all the reasons to continue the struggle. Morozevich had an interesting play – 18...d5 with the following denial of the d5 capture and 27...f5 move in combination with 28...Ґf7 can surprise anyone. Calm Leko was outraged, made mistakes in the time trouble and subsequently had to defend his pieces for the long time. It was a substantial game, but it will not become the pearl of the day. Adams-Polgar game also could not become the best one. Judit got into a hard situation and found a feminine way out of it: she placed the king in the g7-g8-h8-h7 square and moved it within it according to Michael's actions. The monotony and scrupulousness of the play reminded of knitting. And the Kasimdzhanov-Svidler game is also not the best, not enough moves were done. They made half-forced exchanges with ease, and then I heard Petya has some problems and went to look at the situation with poor presentiment. When I saw it I thought that everything was not that bad, because black rooks had some freedom of movement. I decided to seek consolation in it. And then the FIDE world champion came to the conclusion that there are not enough reasons to struggle for the victory. And if someone proves that my and Rustam's assessment was incorrect, and White had chances to win, I will not be disappointed. It is not for the first time this year that Anand and Topalov make a great chess show. Elo favorites played almost 100 moves. And their condition in the third round is their own problem. Grateful public, including me also, has never been really grateful. Let us look at the show, but let me not come into the details of the first and the last 24 moves. Because the first ones are the history, and the last ones are the tables of logarithms. 24.¦xe8+. Here the unexplored territory begins. Previously White did not succeed in getting the advantage, usually putting the bishop on e5 on the 22th move. 24...Јxe8 25.Ґd5 h5 26.ўg2 Ґe7 27.Ґb2 Ґf6 28.Ґc1. If anyone could not understand who profits from the dark squared bishops, the maneuvres on the 27th and 28th moves explained it. 28...Јe7 29.Ґe3. 29...Ґe5? does not suit after 29.Ґf4 because of 30.Јe2. 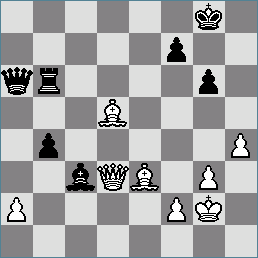 Here 31.Јxe7 Ґxe7 32.c7 with an intention of the immediate end of the game looks tempting in case of 30...Ґf6. 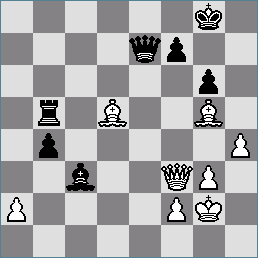 However Black saves himself in a funny way: 32...g5 33.Ґe5 Ґf8!! 34.Ґb7 Ґg7 35.Ґd6 Ґf8 36.Ґf4 (36.Ґxf8? 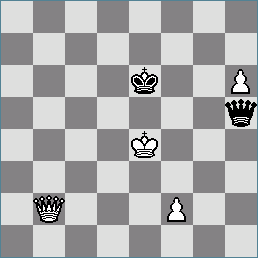 ¦xc7) 36...gxf4 37.Ґxc8 Ґd6, escaping into an endgame with opposite-colored bishops. But a simple 31.Јxh5 still makes Black regret the bishop's lost tempi. 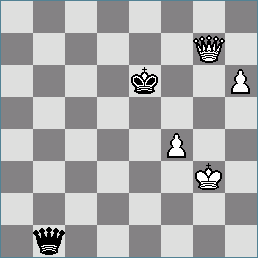 29...g5 is correct with exemplary continuation 30.Ґe3 ўg7 31.Јd3 Јd6 32.Јf5 ¦xc6 33.h4 ¦c7. The reasonable question is: if it is favorable for Black to air his king, then why he cannot play 29...g5 after the text move. However, the extra tempo has substantial significance – in case of 30.Јd3 ўg7 31.Јf5 ¦c7 32.h4 Black does not have time to capture the c6-pawn. 29...¦c7 30.h4. 30...Ґe5 is also possible after 30.Ґf4, because the 7th rank is well-defended. 30...Ґe5 31.Јd3 Ґd6. Computer emphatically suggests 31...ўh8, but it seems that Anand has surely decided that he does not need the g7-g6 move. Moreover, the king move in such a situation looks unnatural: the luft is too widely open, and there is a feeling that you go under a check. It is psychologically much easier to move the king on the h8 square having the h6-pawn. 33...b5. The key Black's defensive idea is to swap exchange and h5-pawn on the dangerous passed pawn. Two moves later Topalov submits to inevitable and parts with his pleasure. 34.Ґe3 Јe5 35.Јd1 Јe8 36.Јxh5 ¦xc6 37.Ґxa7 ¦a6 38.Ґd4 Ґf8 39.Ґe5 b4 40.Јf5 g6. The pin on the 5th rank after 40...¦a5 41.Ґd4 brings nothing because of the weakness of the f7-pawn. If I am not mistaken, more than ten years ago Igor Arkadievich Zaytsev noted in the article devoted to two candidate matches that Anand lacks Karpov's skill to hold the worse ending (opposing him in this aspect to Kamsky). I do not know what role he gave to the psychological aspect, but here we see, that having made a technically faultless regrouping and having freed his pieces, Anand relaxed. His next move is a serious mistake. 46...Јa7? The 7th rank is mined. 46...Јd7 would have been followed by 47.Ґc6. In case of 46...Јc7, as in case of the text move, White makes a double strike at first, and then the diagonal motive enters the play – 47.Јd3 ¦b6 48.Ґd8! The right move was 46...Јf8, and the game would have probably resulted in a curious draw by perpetual pursuit – 47.Јd3 ¦b6 48.Ґd8 ¦d6 49.Ґc7 ¦f6 50.Ґd8. 47.Јd3 ¦b6. After 47...Јb6 48.Ґd8 Јa6 bad is 49.Ґc4 Јc6+. 49.Ґf6!? is interesting. If 49...Јxf6, then 50.Јxb5, and 49...Ґxf6?? 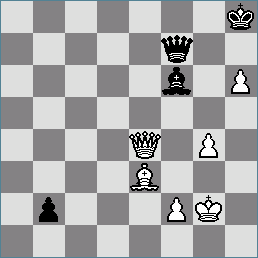 loses immediately in view of 50.Јxg6+ ўh8 51.Јh5+ ўg7 52.Јxf7+ ўh6 53.Ґe4. But Black can answer with 49...ўf8! 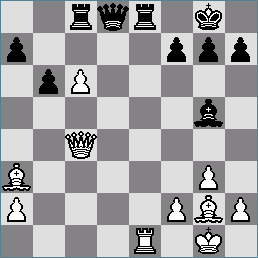 The strongest move is the cold-blooded 49.ўh2!, and Black cannot unravel his major pieces. Anand would have to play 49...¦b6 50.Ґc4 Јa7 51.Ґxb6 Јxb6, but it is still maybe an objectively optimal decision, because he got a worse version in the game. 48.Ґe3 Јa6?! In case of 48...Јc7 49.Ґxb6 Јxb6 White has 50.a4 – a move that creates a passed pawn on the queenside, whereas in the variation in the previous annotation he was deprived of this chance because of the hanging f2-pawn. The public wonders whether Anand considered the ending with the queens and opposite- colored bishops hard regardless of the pawns positioning on the queenside and risked because of that, or he just blundered the attack on f7. Maybe we will never find out Vishy's opinion on this, because he is very well-mannered. 49.Ґxf7+! ўxf7 50.Јd7+ ўf8 51.Јd8+ ўf7 52.Јc7+ ўg8 53.Јxb6 Јxa2 54.Јxg6+ ўh8. I will not tell what will follow 54...ўf8 – your intuition will do it instead. 55.Јc6 Јf7 56.g4 Ґg7 57.h5 b3 58.Јe4 b2 59.h6. It seemed that the game is going to end in the Veselin's victory. But it was his turn to make mistakes. 60.Ґd4? 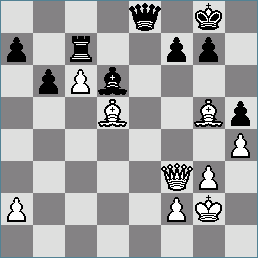 After 60.g5 Black has a sad choice between two lost endings – bishop or pawn one. The first comes in case of 60...Јe7 61.Јxe7 Ґxe7 62.Ґd4+ ўh7 63.Ґxb2 Ґxg5 64.Ґg7, and the second one – in case of 60...Ґxg5 61.Ґxg5 b1Ј 62.Јxb1 Јd5+ (after 62...Јg6 White does not have to take the queen) 63.ўh2 Јxg5 64.Јa1+ ўh7 65.Јg7+ Јxg7 66.hxg7 ўxg7 67.ўg3. And in the game they had the most laborious possible one, queen ending. And though Veselin had chances to win at different moments, Vishy managed to escape. I will not go into details of the computer analysis of time trouble mistakes, I will just point to several moments in which one of the opponent could have played better. 60...ўg8 61.Ґxf6 Јxf6 62.ўg3 Јb6 63.Јc4+ ўh7 64.g5 Јg6 65.Јc7+ ўg8 66.Јb8+ ўf7 67.Јb7+ ўf8 68.Јb8+ ўf7 69.Јb3+ ўf8 70.Јf3+ ўe7 71.Јe3+ ўd7 72.Јd4+ ўe6 (72...Јd6+ 73.Јxd6+ ўxd6 74.h7 b1Ј 75.h8Ј Јg1+ with a draw) 73.Јxb2 Јxg5+ 74.ўf3 Јh5+ 75.ўe4. 85.Јe5+ (85.f5+!) 85...ўf7 86.Јh5+ ўf6 87.Јg5+ ўf7 88.Јh5+ ўf6 89.Јh4+ ўf7 90.h7? (allows perpetual check) 90...Јe1+ 91.ўg4 Јd1+ 92.ўg5 Јd8+ 93.ўh5 Јd5+ 94.Јg5 Јh1+ 95.Јh4 Јd5+ 96.ўg4 Јd1+ 97.ўg3 Јe1+. A draw is agreed. This was a big pearl, and we do not need such every day. On the other hand, this is better than nothing. We will wait for the third round with impatience.